What is it about succulents that appeals so much? It could be their chubby little leaves, or the way they are so easy to root to get more. Whenever you see them, they'll grab you with their appealing shapes and forms. Wondering how to use less water, yet still have a lush garden? 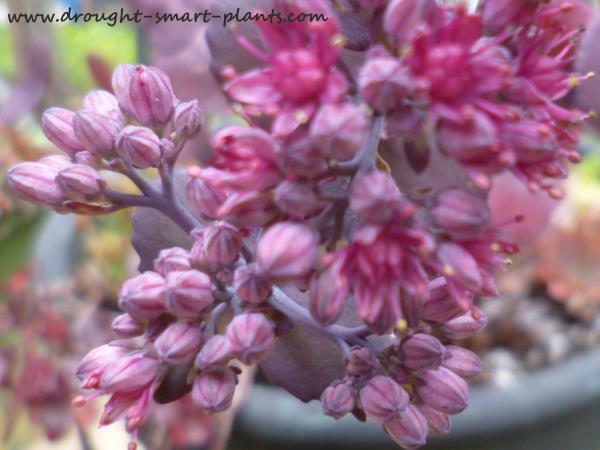 Make your garden gorgeous by using some of the most interesting plants around; succulents. These odd plants have the ability to thrive in drought, storing water for the tough times ahead. 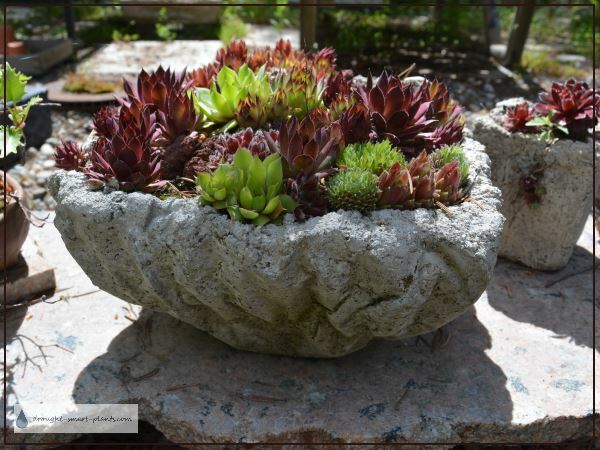 Rediscover Sempervivum (hens and chicks) and Sedum (stonecrop). They've been grown in cold climates for ages, along with several of their cousins. 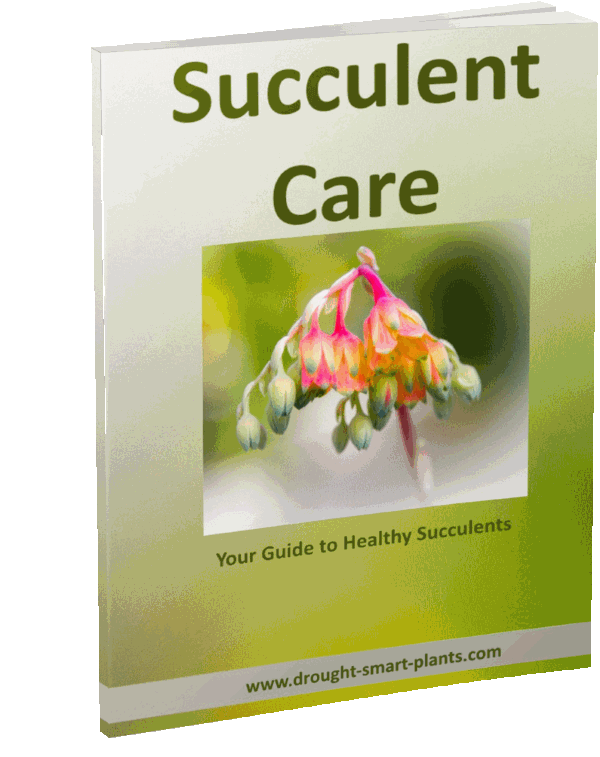 They can take on the challenge of climate change along with other hardy succulents. 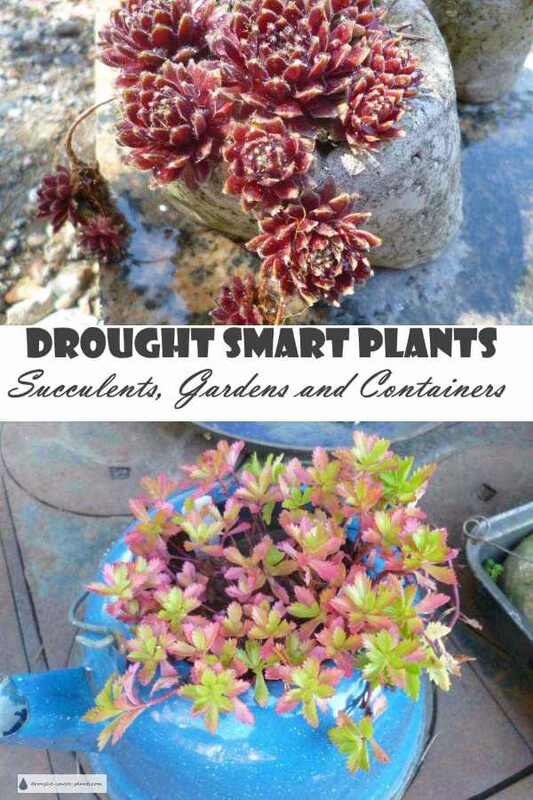 Follow Drought Smart Plants on Pinterest. 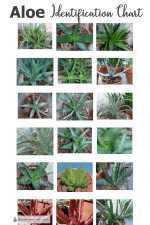 Aloe and Kalanchoe, Echeveria and Crassula are great houseplants. They laugh at drought in hot areas, grown in desert-like gardens or patio pots. Imagine this; containers spilling over with healthy and happy succulent plants on your deck or sun drenched patio. You soon realize they don't need watering every single day like many other container plants. You're no longer a slave to your deck display with these drought smart plants! Get a charming and unique ambiance with unusual hypertufa containers, rustic salvage and hand made garden art. Mix and match hardy and tender species and varieties for a gorgeous summer show. Sometimes, it's not the drought you have to worry about; it's the excess rainfall. How on earth can you store that water for the dry times ahead? Learn all about xeriscaping with the free Xeriscaping E-Course. Make water go further, both in the plants you choose, and the management of a precious resource. Your garden will be the envy of the neighborhood, with hardly any work from you. There are lots of lovely tender types to invite into your home as house plants; fat plants such as Echeveria and Aloe combine so well in containers and planters. Find out how to care for them and deal with any problems. Can't find what you need? 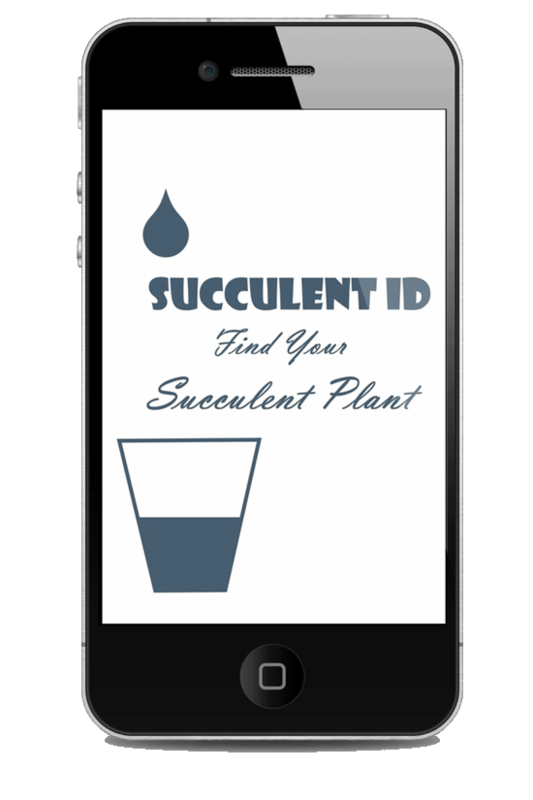 Ask the Horticulturist! 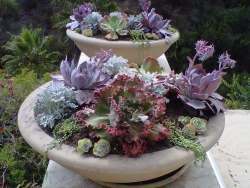 Many gardeners sense a magnetic attraction to succulents of all kinds. They're sassy, chubby, beautiful and charming. They shrug off neglect. Don't get around to watering? They don't care. Your garden will still look lush and inviting. It's a win/win. Plan, design and nurture your perfect ecological niche. 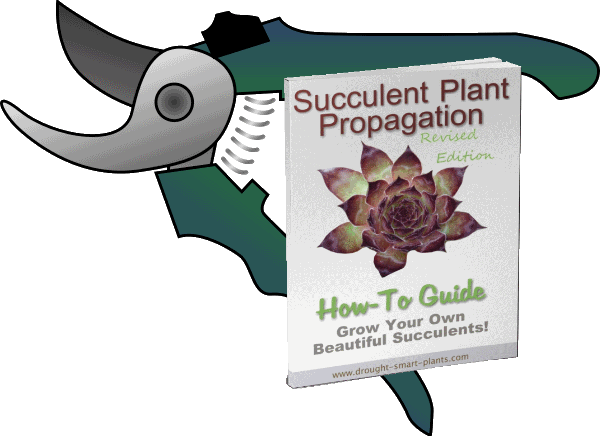 Buy the Succulent Plant Propagation E-Book! 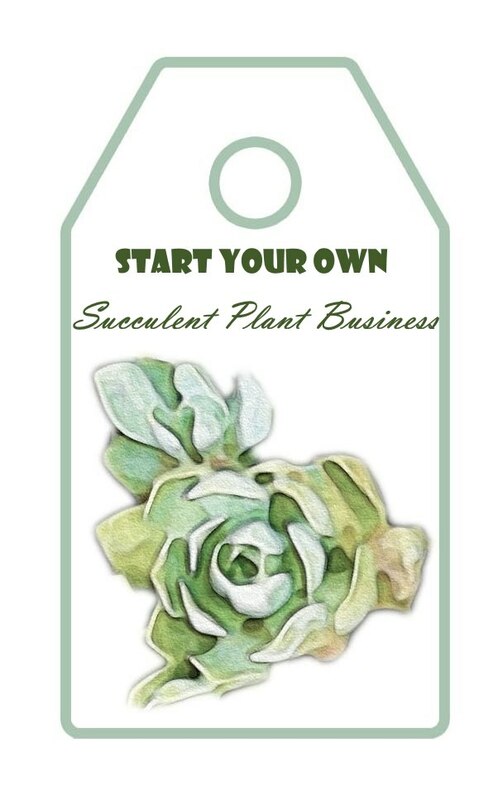 I’m Jacki Cammidge, Certified Horticulturist, avid Xeric Gardener and Wildcrafting Artisan. Find out more about me, and join me on the adventure of a lifetime in the hunt for exotic, unusual, intriguing and fascinating Drought Smart Plants. Lost? Go to Drought Smart Plants Site Map and find every page.